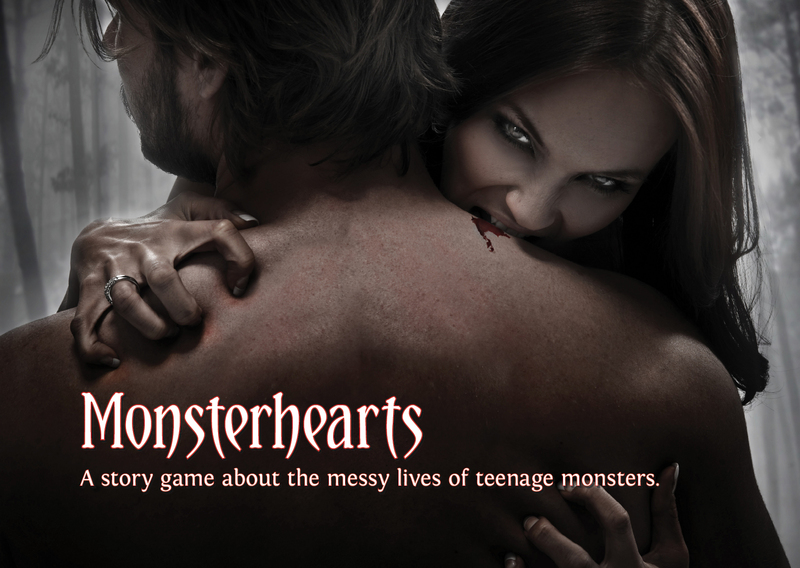 Monsterhearts is a story game set in a high school, albeit a high school attended by vampires, werewolves, and other creatures of strange powers. And it’s less about their monstrosity per se than it is about interpersonal confusions. (At one point, my character, a wiccan able to conjure up visions, had to try to explain birth control and teenage dating customs to her boarding school roommate, a werewolf who had grown up feral.) The game comes with a set of “skins” — different preset monster types you can be for the duration — and each monster naturally has its own powers and abilities. The mechanics of the game emphasize the fact that characters know themselves incompletely and control themselves even less. Everyone has a “darkest self”, a side to their personality that can be triggered if things go sufficiently wrong, in which they’ll be motivated to do antisocial or outright evil things. It’s possible for any character (on winning a roll) to turn on any other: sexual attraction is not entirely at the discretion of that character, though no one else controls how the character reacts to being attracted. Monsterhearts doesn’t have a pre-set act structure (in contrast with the way Fiasco or Shooting the Moon or A Penny For My Thoughts run a small set number of scenes) and doesn’t require characters to define specific goals at the outset. The opening of play takes a bit of hashing out while people RP their way towards having narrative hooks, and a GM is required. Consequently, Monsterhearts is harder to one-shot than most of the other stuff I’ve profiled here. Indeed, after a session that ran about four hours, we had to call for time at a point that left many story threads unresolved: one of our characters had just undergone a dark ritual involving blood samples from many of the other students, and the principal was possibly undead. Nonetheless, this was one of the more straight-up entertaining storygaming experiences I’ve had. Character moves encouraged a certain amount of inventiveness: for instance, my witch character could gain a point to a ritual roll if she did something morally or sexually transgressive in the process of the ritual. The character skins provided opportunity for much hamminess, and our GM did a good job of introducing sinister mysteries about the school itself in order to provide the story some focus. Character creation includes setting up ways that the characters might be indebted or vulnerable to one another, which was welcome and made it possible to start the game with some attitudes towards the other participants, rather than taking them at face value; this made it faster to get to conflicts and more fun to interact. For one-shot play, I think I might have wanted to add some rule that encouraged players to reveal themselves to one another sooner, because we got through our entire session without anyone having actually told his or her classmates about their secret powers, and those moments of revelation can be a lot of fun and help motivate the plot. Maybe more character recognition would have happened naturally over a longer campaign. Play report now up here. I must admit, I’m prejudiced against anything that smacks of teenage paranormal romance (so much cliché going on in that genre), so I was surprised to read a description of a game that sounds really interesting and inventive. It can be difficult to run because of that – you very often get one person in the group who isn’t fully on-board with the idea that the monster stuff is meant as a frame for teenage awfulness, rather than as a wish-fulfillment vehicle. The guy who GMs with us routinely disallows some of the skins that are particularly likely to lead to this – mainly the Mortal, who is essentially Bella Swan, and the Chosen, who is essentially Buffy. Regardless, it’s one of the more user-sensitive storygames, kind of like Penny For My Thoughts – it’s a Play With People You Trust With The Narrative kind of game. If the GM or one of the players doesn’t get it, you can be in for a pretty crap evening. I’ve definitely had good times both with people who like Teenage Paranormal Romance and with people who hate it (though who are perhaps into media criticism and get tickled seeing the tropes of the genre laid bare in the Moves in their Playbooks). The whole game is brilliant, but Mortal is really something special, so I’m disheartened to hear that it’s routinely disallowed. McDaldno is a master of turning unhealthy behaviors into elegant game mechanics, and the Mortal’s moves all encourage the player to behave in precisely the ways that make Paranormal Teen Romance heroines problematic: the external locus of control, the self-effacement, the passive aggression. I’m thinking specifically of the Sympathy is My Weapon and Excuses are My Armor moves, but it’s all over the playbook. Kenneth Hite’s adage, “bad media makes great games,” has rarely been more true than in the case of Monsterhearts. For my money it’s hard to find anything more teenage awfulness-y and less wish-fulfillment-y than the Mortal, and you should encourage this GM to let loose the game’s whole palette. Part of the deal is that we almost entirely play oneshots, so it’s more important than usual that every character gets a similar degree of spotlight time; and the Chosen and the Mortal both have a tendency to make the story be all about them. I suspect that in the multi-session play that Monsterhearts is really designed for, there would be more room to ameliorate that. Emily put it very well when she mentioned how the mechanics emphasize how little the characters know about themselves. That is what this game is about. It is not so much a game about monsters who are teenagers as it is about teenagers who happen to be monsters. Like Sam said, it’s very user-sensitive. The MC’s main job is to frame the world and react to the PCs who drive the story forward. It encourages the characters (who are still teenagers) to be reckless and thoughtless. That’s fine! Part of the fun is dealing with the fall-out that comes from the sometimes bad decisions characters make. Players must be willing to take initiative.